News of the opening of “State of Deception: The Power of Nazi Propaganda,” a powerful exhibition created by the United States Holocaust Memorial Museum, has already generated some passionate conversation on social media. We’re honored to be hosting this thought-provoking exhibition, which was created in 2009 by the United States Holocaust Memorial Museum and has been displayed in other great institutions around the country, including the Field Museum of Natural History in Chicago and, most recently, the Bullock Texas State History Museum in Austin, Texas. State of Deception is a historical study of propaganda, and poses questions about the power of communication and the importance of mindful media consumption. Some have asked if the Museum timed the exhibit to coincide with the current political climate. We did not. 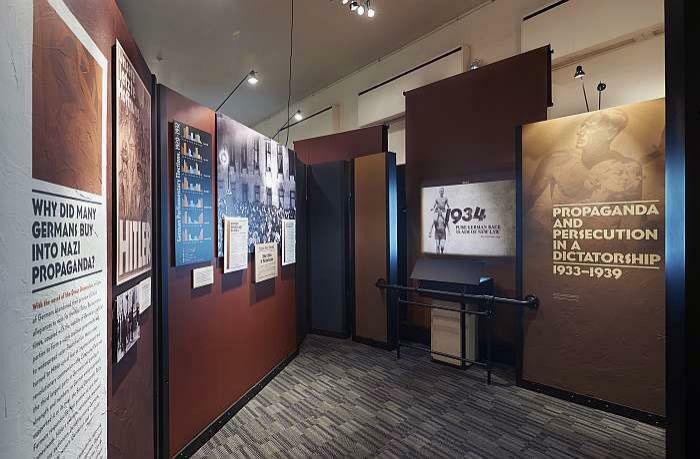 In fact, the exhibition has been scheduled since January 2015, and was created by the United States Holocaust Memorial Museum before that—in 2009. However, we know that the tone of the recent election and other current events have heightened sensitivity to this subject matter. Please note that the exhibit itself (which predates the recent election by seven years) does not have any political agenda. Nor does the United States Holocaust Memorial Museum or The National WWII Museum. Rather, the exhibition’s goal is to raise questions about the power of propaganda and to encourage people to think critically about the messages they receive. It’s exciting to see that the exhibit is already striking a chord with so many. We encourage you to visit the exhibition while it’s in residence at the Museum (through June 18) or experience it virtually via the links presented below to form your own opinions. On Facebook, Twitter, and Instagram, we’ll share the latest news about the exhibit and surrounding programs, and we hope you’ll Like and Follow us to hear the latest. These channels are also a wonderful forum for discussion and we welcome your engagement! However, in order to ensure that the conversation remains welcoming to all who view our posts—including people of every political stripe as well as school groups, veterans and their families, Museum visitors, and more—we ask that all commenters on these channels remain mindful of the educational intent of these posts, and respectful of the community receiving them. To that end, please pause before posting to consider the following social media guidelines, modeled on the guidelines used by our friends at the United States Holocaust Memorial Museum to encourage an engaging, inclusive dialog. — Comments should be relevant to the post’s topic. — Courtesy is essential. Comments with vulgarity, threats, or abuse aimed at others are not acceptable. — Comments are an appropriate place to question or disagree with ideas and opinions, but not make attacks against groups or individuals. — Comments that share misleading or historically inaccurate information will be deleted. Thank you for your thoughtful consideration of the above guidelines, and thank you for your continuing support of The National WWII Museum. Find a listing of all of the public programming scheduled for the exhibition here. Find the United States Holocaust Memorial Museum’s main site for the exhibition here. Find the United States Holocaust Memorial Museum’s accompanying educational site here. Watch a live walk-through of State of Deception with United States Holocaust Memorial Museum educator Sonia Booth here. Stream the January 26 opening reception for the exhibition here. Watch a Lunchbox Lecture by Assistant Director of Education Gemma Birnbaum about propaganda specifically aimed at the youth of Nazi Germany here.